The SIS machine W250 model and SIS electrodes when operated in REGEN operational mode, completely and accurately fulfill the specifications of the electrical stimulation method for tissue healing and regeneration pioneered by American orthopedic surgeon, Robert O Becker (1923-2008). Stimulation of fibroblast (FB) cells in the wound to self-modify to have tissue regeneration abilities resembling stem cell potentials. The silver iontophoresis of the SIS machine W250 model stimulates the dedifferentiation and transdifferentiation (self-modification) of mature FB cells in the location of the damaged tissue—the dedicated cells that make the structural, fibrous extracellular matrix of the body. The newly modified cells become available to remodel existing tissues and form new tissues to an extent not normally possible in the human body. When applied to surface wounds, the newly modified FB cells are available to remodel wound site tissues during the proliferative and remodeling phases of wound healing. The electrical stimulation can also result in less scar tissue formation, with faster and better wound healing. SIS machine W250 model function: real-time, self-adaptive scaling of stimulation voltage to SIS electrode size and damaged tissue properties within the low intensity direct microcurrent range for tissue regeneration. 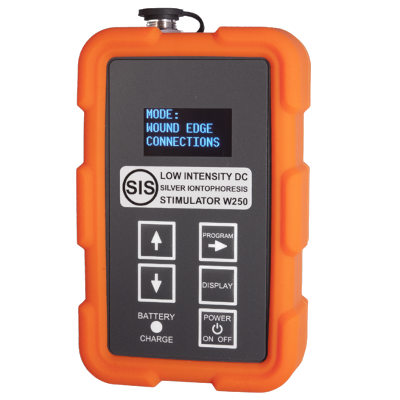 Based on extensive clinical research and results—included first of its kind radiographically confirmed chronic lung scar tissue reversal—the SIS machine W250 model applied in REGEN operational mode, utilizes data-based calculations to determine the appropriately scaled electrical stimulation for any internal tissue target. SIS machine W250 model function: user-programmable SIS (+)positive electrode size for the individual application and target tissue size; self-adaptive scaling of low intensity direct microcurrent to the programmed (+)positive electrode size for tissue regeneration. Treatment and prevention of infection. Direct constant-current silver cation delivery to the wound. Effective for antibiotic resistant superbug infections. Faster wound healing. Real-time, self-adaptive supplementation or replacement of the key local bioelectric controller of wound healing—the wound-generated electric field; boosts the natural 'current of injury'. Better healing, less scar tissue. Stimulates fibroblast cells in the wound to self-modify to have tissue regeneration abilities resembling stem cell potentials. SIS electrodes do not contact wound. No discomfort or disturbance of new (granulation) tissue growth. For all types of surface wounds, skin ulcers, and internal fibrotic scar tissue. No drug side effects or risks. Quick and easy to apply. For clinic or home use. Robust high-end componentry construction. Including external casing and connectors. Each unit is a precision electronics instrument, individually assembled, tested, programmed and calibrated by our engineers in our Australian factory. 5 year warranty.